As everyone involved in Buffalo’s social media scene surely knows, FroYo has finally arrived on Elmwood. Over the last few months, two shops – Yotality and White Rabbit – have been going through their (seemingly long) interior construction phases on Elmwood while simultaneously opening shops in the suburbs (Williamsville and Tonawanda, respectively). While White Rabbit hasn’t opened yet, Yotality did just a few days ago. We stopped by yesterday with a friend to finally try it out. As we approached Yotality, we were immediately taken aback by the large, brightly colored patio that has been added outside of the storefront. Compared to the very classy and lounge-y feel that Chow Chocolat had months and months ago, Yotality presents itself as a typical FroYo establishment: lots of saturated colors and strong lighting with touches of stainless steel and translucency. Cosmetic changes aside, we were really excited to see a dedicated FroYo shop open only blocks away from our apartment. Aside from occasionally getting Red Mango in Manhattan’s LES or the few times I went to Snog while living on the King’s Road in London, Megan and I aren’t really frozen yogurt fanatics; I rarely even make it to the acclaimed Plum Dandy down the street from my college. 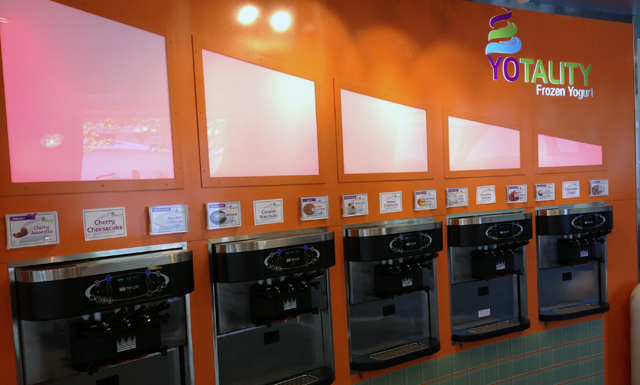 Yotality offers 10 different flavors each day, certain pairs of which can be blended (for a total of 15 “different” total choices). 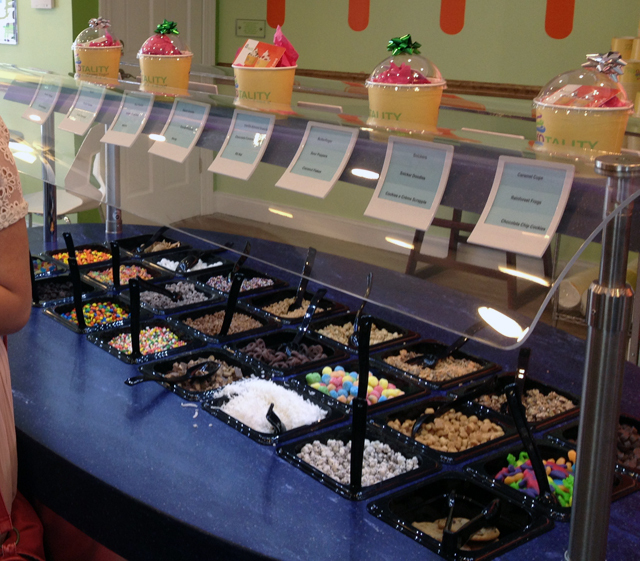 There are also two separate toppings areas – one with sweets and candies (pictured above) and another with fresh fruit, granola, etc. We ended up getting the espresso flavor, the salty caramel pretzel flavor, and the blend of the two: caramel macchiato. 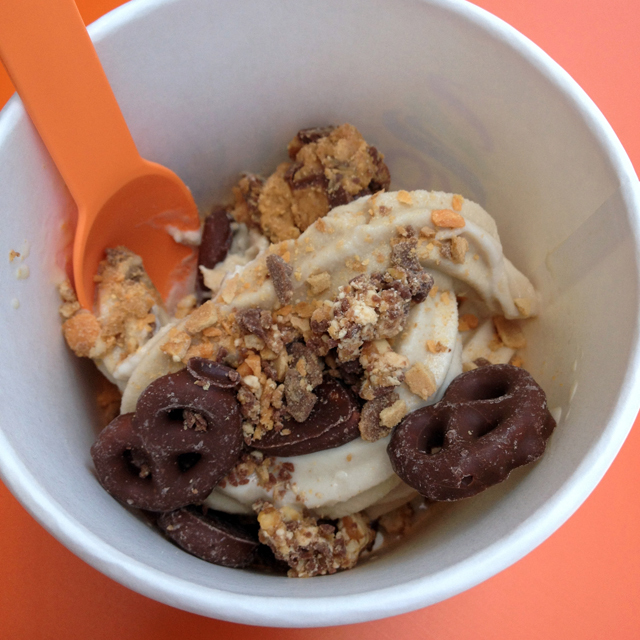 Since all of the flavors we tried were of the sweet variety, our toppings followed suit; for example, I put chocolate covered pretzels and crushed Butterfingers on mine. At $.52/oz, my medium-sized amount of FroYo & toppings above came to about $3.50. And since it was one of the first warm weathered days Buffalo had seen in a while, we sat outside on the patio and ate. Overall, we enjoyed the combinations we made (how could one not enjoy FroYo for breakfast) – but with a few important reservations. While the flavors we chose tasted good, they could have been more intense: I think “vanilla caramel latte” would sum up the flavor more precisely than “espresso + salty caramel pretzel”; it’s the same idea, but with one lacking in execution. The texture also left a little to be desired. 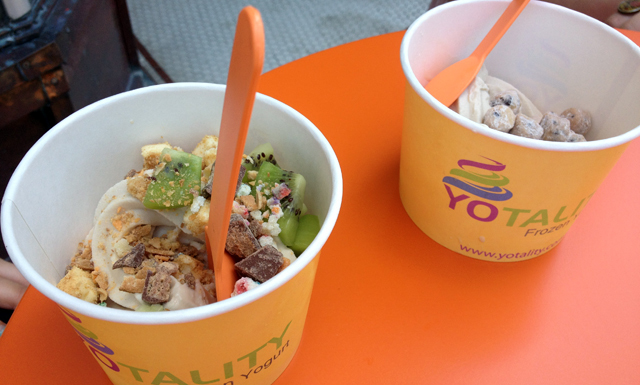 While FroYo is supposed to be a low calorie dessert, Yotality felt light: a bit too icy and just not creamy enough. Suspecting that maybe Yotality was in fact healthier than other chains like Red Mango, I double checked the calorie contents online only to find out that they’re almost exactly the same. This leads me to believe that Yotality’s texture and flavor woes are rooted in their yogurts’ preparation and freezing – not from lack of stabilizers or a lesser fat content. And one final note: we haven’t yet tried any of their tart flavors which we suspect will vary a least a little in texture and taste from the sweet ones we tried. When we return to try those out, we’ll update this post with our opinions. In the meantime, we’ll be waiting for White Rabbit to open up and continue hoping that Yotality will improve over time.